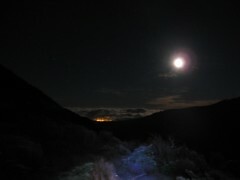 Last weekend Sam, Craig and myself were able to get through a Tararua Moonlight Southern Crossing. I wrote about an aborted attempt to do this just over a year ago when Craig and I were ready to go, but pulled out because it looked certain that the Tararuas would still be shrouded in cloud. A big storm was also coming 24 hours later that could have caused problems if we’d been held up for too long, and it proved to be really bad for a couple of people on the night following the one we planned. That was my first boycotted Moonlight Southern Crossing, and Craig’s third. There’s a tricky set of circumstances that have to come together, and at that point it’s necessary to be able to pick up and go on short notice. 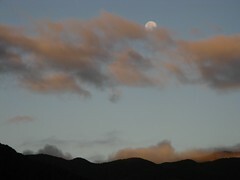 This year, a departing southerly had dumped snow on the tops a day or so earlier, the stormy weather had since passed by, the sky was suspiciously clear (as opposed to clouds that so often dominate the Tararuas), and there was a Full Moon. All of these requirements for a Moonlight Southern Crossing came together at the same time, which is a rare event, and to top it off it was a weekend! And waiting on the road upstairs to be collected at 1pm on the Saturday, I had a phone call where Craig told me his car wouldn’t start. Flat battery. 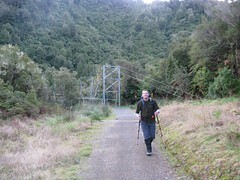 Location: Tararua Forest Park, Otaki Forks to Kaitoke. People: Sam, Craig and me. Also see: Craig’s account of the same trip. I find this type of thing notoriously difficult to pack for, because it’s not something I do very often. The Tararaua Southern Crossing is typically a 3 day tramp, but with some effort and fitness it’s feasible to walk it in a long summer’s day, or (in this case) a long winter’s night, albeit using some basic alpine skills. It helps a lot to reduce weight but I don’t like leaving behind safety equipment in the Tararuas, ever, or generally in back-country places. In the end we all took sleeping bags and bivy bags in case of emergency (but didn’t bother with a tent or any other kind of shelter), and I left behind a few luxuries like extra hut clothes and a ground sheet, and the food was much more biased towards lunch-type stuff. I threw in a few Moro bars purely for caffeine content. I think maybe I saved a few kilograms, even if it was hard to tell after a while. Adding the ice axe after all of this didn’t help with the weight thing, though. Fortunately Craig managed to get his car running with the help of a friendly neighbour, and having left town an hour later than planned, we were writing in the intentions’ book at Otaki Forks at about 4pm, all ready to leave. 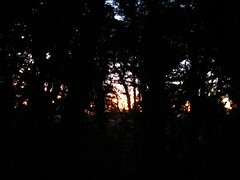 This meant a late afternoon start up to Field Hut. We were joking about how Craig was going to get his car back to town later — I’d informally agreed to drive him back to Otaki Forks the next day… maybe fairly late in the day, or on Monday evening after work. As we joked across the field near the junction leading off to Waitewaewae, a lone figure approached us on the way down from Field Hut. Sam and I were busy joking about how we should ask this person to drive Craig’s car back… would Craig trust a random person? Well, it turned out Craig did trust this random person, because as he got closer it turned out to be Spencer — a friend through the trampey club — and we not only trusted him but he was more than happy to drive Craig’s car home for him. 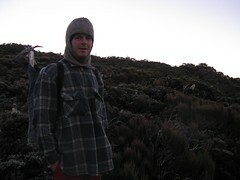 Spencer had been up past Kime Hut during the day, but turned around after encountering some slippery conditions earlier in the day, not having wanted to keep going through that on his own. He’d not been able to get the door of Kime Hut open, which was frozen shut. Things may have changed through the afternoon, though, and although we’d not packed crampons we did have ice axes. We’d just have to go up and see what things were like — the opportunity was far too great to not try at all. We waved goodbye to Spencer and continued on. With the crisp clear skies, and actually being a day before the real Full Moon, we saw the nearly full disc of the Moon above the eastern horizon as we climbed Judd Ridge. During our ascent as the Moon climbed higher, the Sun set in a brief wash of bright yellow and orange light through the leaves. 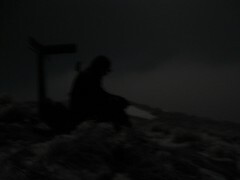 We made it most of the way to Field Hut by about 6.25pm, almost without torches but succumbing to their use in the last few minutes as the shadows under the trees became too dark to walk safely. Nobody was staying at the hut, which seemed surprising on the first weekend of really nice weather for a while. I wrote a brief note about our plans in the hut book, we re-filled water bottles, and immediately (but too late) discovered the water was contaminated with yucky toxins. Thanks a lot all you annoying people who burn your toxic rubbish in the fire places instead of carrying it out. What happens, of course, is the residue settles on the hut’s roof and runs into the water supply, so we basically had yucky barbecue water. Anyway, it was too late to worry. Our water bottles remained full in case it was difficult to find later on. There would probably be tarns here and there, but chances are the tap at Kime would be frozen over by now. A short walk further up, and suddenly we were above the bush-line approaching Table Top, looking down on the clouds trapped in the valleys below us. There was still not much snow, the tussock was well frosted over. Things gradually changed as we climbed further past Bridge Peak, and by the time things flattened out the snow was more wide-spread. We mostly avoided the established ground trail at this point, which tended to be covered in ice and not as easy to walk on. Walking beside it through the tussock was fine, though. 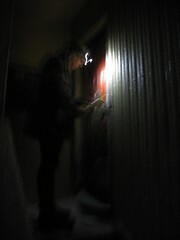 At 8.45pm we reached the sign-post on Hut Mound that claims Kime Hut is 15 minutes away. As Sam expressed, it’s about the fastest 15 minutes ever because by this time Kime Hut is an easy 5 minutes below, and that’s how long it took us. Sam operates on the door latch. The door was frozen shut, which is exactly what Spencer had warned us about earlier. With a closer look it turned out to be the bolt on the door that was the main problem, and the ice around the bolt was no match for Sam with an ice axe and a few minutes of careful sculpting. It was about lunch time by this point, and we pulled out some lunch-time snacks. Kime actually felt warm inside at first, very unusual. Its reputation as a refrigerator is deserved. Thinking backwards I think the warmth was an illusion, with me having warmed up from the movement in getting here. With ten minutes of sitting down eating my solidified caffeine, I was definitely feeling the cold. As expected, the tap was frozen at Kime so I kept my toxic barbecue water. As Craig and I left, Sam kicked a hole through the ice in a small tarn (maybe a puddle) outside Kime Hut, and re-filled his bottle, but I was already wanting to get moving and warm up far too much to stop and unpack again. Sam caught up after a few minutes. A very bright planet Venus hung in the western sky behind us as we left Kime to ascent Field Peak, and the Southern Cross sat roughly ahead of us. By now the Moon was fairly high in the sky and lighting our way, with no need whatsoever for torches. There was less snow that we expected, but the ground and was completely iced over. As we moved through the landscape, hundreds to thousands of glittery silver reflections of the Moon shimmered all over the ground around us. We sat for a while on Mt Hector. Getting down the south face of Hector was similar to the south face of Field Peak, generally okay. I think the trickiest section was making our way over both sides of the Beehives, through which there were a couple of short zones where it was necessary to balance on rock covered in black ice. On one occasion I just went down a couple of metres in a controlled slide, which seemed the easiest way to go. The ice axes helped a lot here and I’m glad we brought them with us. From there on we were at a lower elevation, the air around us was once again clear of any kind of clag, and the ridge-line was more flattened out. With less slow and less steep regions, slipping became less of a concern. For much of the rest of the night, however, I still had my ice axe out simply to use the spike for support, not wanting to completely trust the rocky parts of the track ahead. The snow, on the other hand, was fairly gritty and easy to walk on. Craig waits on Aston Peak. 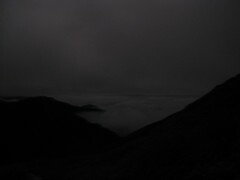 At 1.30am we sat on Aston, signposted as 2 hours from Alpha Hut and still surrounded by iced-over tussock. Venus was long gone over the western horizon by now, and to our left (later to be in front of us), another bright object which I presumed to be Jupiter was rising. The southern cross was now nearly standing on its head, having rotated nearly a third of the way around its celestial pole during the past 6 or 7 hours. We sat here for a while, not feeling especially motivated to get up and move quickly. Within about 15 minutes or so, however, we were up and on our way. Alpha Peak was clearly visible in the distance, chaperoned by a long Quoin Ridge leading down to the Hutt River. Behind it was a set of lights from somewhere out in the plains of the Wairarapa. Probably somewhere like Martinborough, but we didn’t check to be sure. It still took us an hour to cover that distance, and by now the Moon was clearly beginning to fall from its high point in the sky. To the north-east I could see the constellation of Orion beginning to skim the northern horizon. I usually associate Orion with the summer night sky, and it’s unusual (for me at least) to see it in the winter like this. With it rising another 4 minutes earlier ever night, however, I guess it will be high in the sky during mid-evening by the time summer comes around. Sitting on Alpha Peak in the moonlight, I kicked a hole through the ice in a puddle, briefly considering replacing my toxic barbecue water that I’d been sipping since we left Field Hut, but decided not to when the murky mud surfaced amongst my access point through what had previously been a settled and shiny iced-over water point. Alpha Hut wasn’t too far away. Still, we briefly considered simply pulling out the bivy bags and sleeping bags and spending the night up on Alpha Peak. The conditions were perfect for it. Fifteen minutes down from Alpha Peak, at 3.15am, we reconvened at the bush-line, a relatively short distance from Alpha Hut, which we reached about 10 minutes later. Craig quietly opened the door for a peek inside, as we didn’t want to disturb any inhabitants, but he soon declared that nobody was home and so we took some liberty in entering and relaxing for a while. I have to admit I was surprised that on a Saturday night during a weekend with the first near-perfect weather in some time for both a Saturday and Sunday in succession, we didn’t meet anyone in any of these three huts. I’d have thought there might be a few people getting up to the tops for the weekend. Perhaps they were all outside walking around in the moonlight as we were. From here we’d be leaving the tops, and heading down-hill on our way out. Feeling the need for some caffeine, I ate another Moro bar. It was 4am by the time we left, needing to either stop properly or get moving, because it was increasingly cold just sitting around. The eastern direction from Alpha Hut leads through a dip called Hells’ Gate. I’ve been through it before on a Saturday afternoon in nice weather, having come up from Cone Hut and Bull Mound. At that time I didn’t really notice it as much more than a dip into a saddle followed by a climb, and I guess I was expecting something similar this time. Unfortunately this expectation was not quite so realistic when approaching the same section on the back of 12 hours of walking, and having had no sleep for 19 hours and counting. It just dropped and dropped, there was tree-fall, slippery areas, and it kept dropping steeply, and then we finally began to climb again. This took well over an hour, and at 5.25am we finally sat next to the DoC signpost at the top of the eastern side of the saddle, ready to head down Marchant Ridge. I’ve never been along Marchant Ridge before, but it has a strong reputation that precedes it. The first time I visited Alpha Hut, page after page of the hut book was full of people declaring they’d experienced their worst tramp ever, or wasted a day of their life. 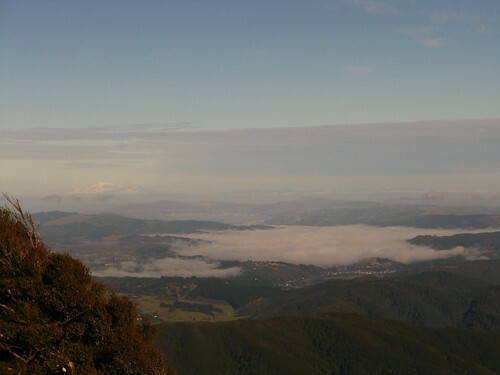 John Pascoe, a well known mountaineer (and critic of the Tararuas) declared in his 1952 book “Land Uplifted High” that Marchant Ridge is up-hill in both directions. He may well have lifted this quote from the talk of the day — as Craig noted at the time we visited, the ridge has no less than 8 officially recognised spot-heights along it. I think the most potentially demoralising part of Marchant Ridge may be that it carries on for such a long distance just below the tree-line, ensuring that views of the surrounding landscape are limited, and ensuring that little progress is made in actually getting down. Marchant Ridge is heavily walked because it’s the primary way into or out of the Tararua Southern Crossing — an honour that would likely have gone to the much nicer Quoin Ridge next-door if the Wellington Regional Council hadn’t usurped Quoin Ridge as part of an official water catchment zone, and limited access accordingly, completely preventing it for many decades and even now only allowing people to pass through without stopping. I don’t want to sound too critical of Marchant Ridge. This visit beginning at 5am having had no sleep for almost a day was my first visit, and I was beginning to feel really tired, especially after Hells’ Gate. Thinking objectively though, it wasn’t really that bad. It’s a nice bush walk, and I think if some time I visited Marchant Ridge for some kind of Marchant Ridge Appreciation Tramp, I might find a lot of things to like about it. For one thing, given how the ridge spends so much time just below the bush-line, there’s a lot of walking through mossy goblin forest. Somehow Marchant Ridge reminded me of the times I’ve visited Nelson Lakes, in the sense that you can walk for a really long time and very little actually changes. If you’re the kind of person with a short attention span, then perhaps it’s not for you. Anyway, Craig stepped in a hole somewhere near the beginning, aggravating a knee injury, and so we had a lot of time to take it in for what it was. Under the circumstance, feeling so tired, I was personally starting to wish Marchant Ridge would hurry up let us head down-hill so I could at least feel as if we were getting somewhere. Somehow this changed from about 7am onwards. The Sun began to rise, and suddenly it was daytime. We didn’t need head-torches any more, and I guess a switch flipped over in my brain telling me I didn’t need to feel tired any more. It was a new day, after all, and I’d usually be awake by this time. The objective part of my mind told me that this effect would likely wear off about mid-afternoon, at which point I might just collapse. We should be out by then. Marchant Ridge has a few officially maintained side tracks that lead down to the Tauherenikau River. We passed the first of these off the first spot-height, called Omega (1118), and it’s a direct way down to Tutuwai Hut. The second, which we passed at about 7.15am, is known as the Block XVI (ie. Block 16) track, which retains its name from the days when tracks were named after the numbered segments into which the range was divided. I’m not sure what the reasoning is for the Block XVI track — on the map, it’s like a track designed to go from nowhere in particular (an anonymous point in a ridge with exit points on either side) to nowhere else really special. I may walk it some time to see where I end up, but at this time there’s not much motivation to walk 2/3 of the way along Marchant Ridge simply to go down again. I’m sure there’s a good reason why it’s still officially there, rather than having devolved into an interesting off-track navigation or hunting route as has happened with so many other old tracks. Maybe one of the nicer things about Marchant Ridge, at least as I write this, is how the trees open up for a while, notably around Marchant Peak. The cleared section of the ridge is covered in regrowth but it’s not high enough to block the sunlight or obscure views. Apparently this is at least in part due to a major fire along the ridge some time ago. Maybe some frustrated exhausted person decided they’d try to burn the ridge down? I wouldn’t be too surprised. As we continued along the relatively open section of ridge during the clear and crisp mid-morning (now about 9.30am), we could easily see the basin of the Hutt Valley ahead of us, completely shrouded in very low and reflective fog. Behind it in the far distance, the towering snow-covered shape of Mt Tapuae-o-Uenuku stood up from its location in the Inland Kaikoura Range of the South Island. It’s often visible from Wellington, but I don’t remember having seen it as dominant as this from the North Island. I guess it’s the altitude we were at that helped. The Hutt Valley, Tapuae-o-Uenuku behind on the left. Eventually the track leaves the main part of Marchant Ridge, veering south (from south-west heading downwards) as the structure of the spurs becomes more messy. It’s here that the elevation actually begins to drop, finally. At about 11.30am, we arrived at the track junction at the top of Dobson’s Loop, where an alternative track leads down to Smith Creek Shelter, and finally I was in a place where I’d been before. By now it was about 11.30am, and we were starting to think about how to get away from the dead end of Kaitoke. A taxi was the best bet for us, so we called ahead from here, intending to be down at the road within about an hour. (Hutt and City Taxis would get us from Kaitoke to the Upper Hutt Railway Station for about $50, which isn’t bad when split between three people.) Rather than go the full distance to the dead-end of Marchant Road, where teenagers burn out their cars on Friday nights, we decided to drop off to Kiwi Ranch. 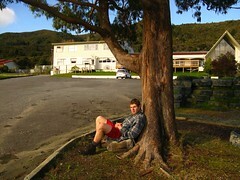 Kiwi Ranch is a Youth Camp, which incidentally will let people park their cars in a more secure area for a small fee. Even better, there’s an un-signposted (but very obvious) track that leaves the main track, about 10 minutes from the main road-end, and drops straight into Kiwi Ranch. Very handy. It turned out that in the state we were in, an hour wasn’t nearly enough time to get down to the road from the top of the Dobson Loop. Fortunately there’s still very good Vodafone reception from near Puffer Saddle, and we were able to call back and postpone the collection time for another hour. Finally, at around 1.15pm, we stepped out into the sunshine on the main driveway of Kiwi Ranch, with about another half hour to spare before our ride showed up. And that was it. Tararua Moonlight Southern Crossing completed. Overall it took us 21 hours from start to finish, of which my GPS thinks we spent about 13 hours actually moving. This was about 4 or 5 hours longer than we’d anticipated, having expected to be walking out at around 8am or so, but that was fine. It was a nice day, and to be honest I just felt like sleeping. If and when I do it again, I think I’ll bring crampons. They’d not have been any use on this occasion, so we were lucky, but it was clear once we were there that had there been more snow than there was, there would have been several slopes that could have been tricky to cross, especially in the vicinity of Hector and on either side. I guess I still haven’t grasped the main driving motivation behind walking a Moonlight Southern Crossing. I’m really glad I’ve done it, nevertheless. There are recurring stories of people doing this in the past, and it’s something for which the opportunity is quite rare with the combination of recent snow, calm clear weather, and a Full Moon. If the opportunity comes up and there’s an interest and ability, it’s best to grab it while it’s available as long as it can be done safely. Getting over the tops through the glittering snow in moonlight was a novel experience for me. On the other hand, it’s not as if it’s necessary to walk a Southern Crossing overnight to see snow glittering in moonlight. We could have simply gone up to Kime, walked around in circles in some kind of awe at 2am, and walked down again the following morning. The transport would have been easier, too. Maybe one of the rewards for me is also that I managed to get some new red line, never having walked a full Southern Crossing in the Tararuas before now. I guess if someone asks me from now on, I could say “yes, but not during the day”. I’ll have to walk a Southern Crossing during the day some time and see what I’ve missed out on. Maybe I’ll also go back and take a better look at Marchant Ridge, without the lingering problem of it just being a frustratingly long conclusion to something else. 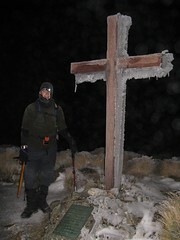 This entry was posted in tramping and tagged bagged:alpha hut, bagged:field hut, bagged:kime hut, night time, snow, tararua southern crossing, tararuas, tramping, wellington tramping and mountaineering club. Bookmark the permalink. The Block XVI track drops from Marchant Ridge down to the site of the now long gone Allaway-Dixon hut just above the Tauwherenikau River ( please note the w in Tauwherenikau which all variants of the now gone Tauwherenikau huts used. ) The hut was owned by the University Tramping Club and had vertical punga walls and Hurricane type fencing wire as the base for bunks. A most unpleasant place to sleep and I long remember a group of University students wandering into the hut rather drunk but complete with bagpipes. There is now a small fireplace that marks the site just upstream from a bridge crossing the Tauwherenikau River. It’s actually just as useful to drop down this track rather than the Bull Mound or Omega tracks. The tracks named after Blocks were the old Forest Service possum trapping blocks which you were supposed to apply for though I never met any possum trappers between 1956-76. There’s still a Block 19 track and I helped recut a Block 18 track years ago but I don’t know if it still exists. Dobson’s Hut is now gone and I think Alpha as well. Hi Doug. Thanks for all that info. I came across the Block XIX track a few months ago when we were coming down from Cone. It’s not marked on the modern maps but we had an older map that showed it. I meant to keep an eye open for it just to see how easy to find it’d be, but I ended up distracted and we must have walked straight past it. I’m thinking it could make an interesting diversion next time I’m going that way. Did you mean you think Alpha Hut may be gone? It’s definitely still there, unless you’re referring to the original Alpha Hut that was on the wrong side of the ridge and needed to be torn down and re-built a short distance away to comply with new regional council water catchment rules. I read somewhere Alpha had burnt to the ground – I’m glad it hasn’t. I might add when I used to walk Marchant Ridge much of it was open and still recovering from high winds in February, 1938 and bush fires not long before. I was well known to Joe Gibbs ( died 1969 )who originally cut that track. Hello again. Wow, it sounds as you’ve been there to see a lot of the Tararua’s recorded history. I’d thought you might have been thinking of Powell Hut which burned down in 1999 (and has since been rebuilt), but I looked it up this morning and it turns out the 1953 version of Alpha Hut burned down in the early 1980s. The present one was rebuilt in 1982, and extended in 1996, probably for all the visitors given how popular the Southern Crossing has become. The most recent is the only one I’ve known and it’s a very spacious hut, now. Yep – the pre 1982 hut was what I was referring to. Neat. Thanks for that, Doug. Those photos are impressive.